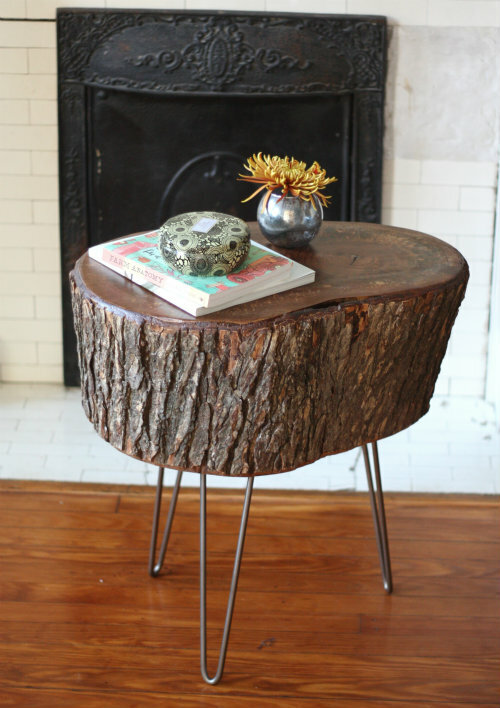 You guys, we made a table from a slice of tree stump, no joke! We mentioned tackling a DIY project we were pretty excited about weekend before last — well we finally got it finished and this is it. Here's the whole (very long) story of how this all came about and step by step instructions of exactly how it went down in the event you want to tackle making one of your own! It just sat there day after day and about 2 weeks after she began seeing it she started telling me each evening how she wanted me to go get it so we could make something out of it. I kinda brushed it off at first thinking it would get picked up, but let me tell you how persistent Mary can be once she gets an idea in her head. You can probably tell that by the third week in a row she was walking by this stump that we drove over to it one evening and picked it up off the sidewalk to bring home. Once getting the stump slice back home, we set it in our garage to hang out and let it continue to dry out for another week while we talked about what we wanted to do with it. We decided a side table to replace the red stool we've been using in place of a table in our family room could be pretty awesome, so we went for it! 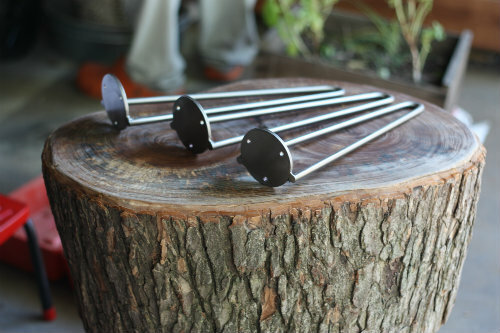 Mary had already been on the lookout for a set of hairpin legs, thinking we might like to raise the trunk our TV sits on, so we went ahead and bought this handmade set of 3 from Cream Street Shop on Etsy. Not only were they super affordable, but they are made right here in Virginia — we were sold. 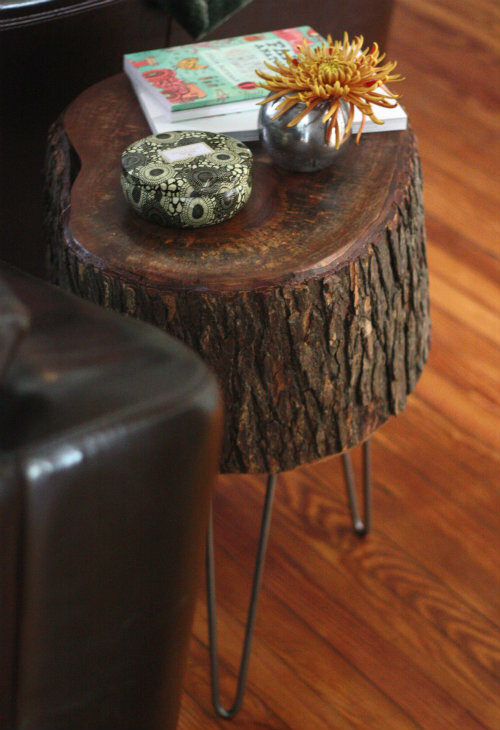 Since we knew we'd want to make the stump into a side table in-between our 2 couches, we'd need the end result to be right around 24 inches tall. 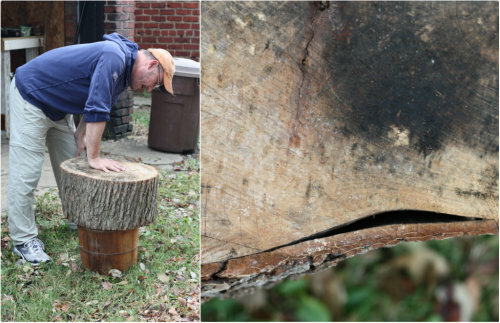 Once we had the stump hanging out in our garage we were able to measure it to find it was 10 inches tall. This is how we were able to determine the length of the legs we'd need to order. We figured 14" legs plus the 10" tall stump would put us right into the sweet spot. Weekend before last, after a week or more sealed off in our garage, we brought the stump out in the alley to start working on it. 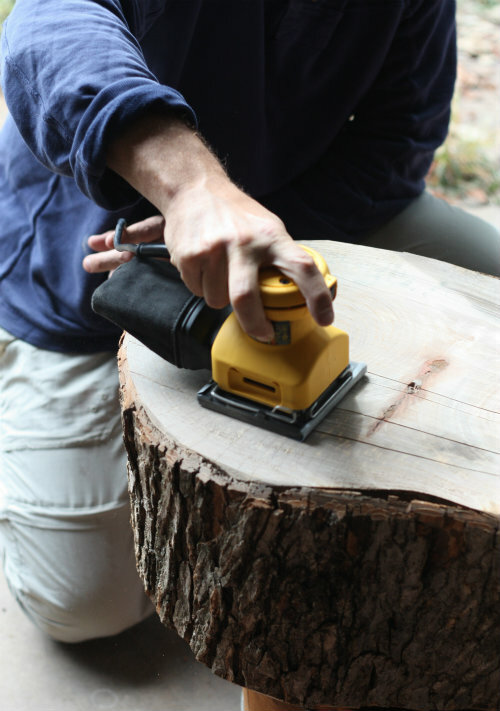 I'd talked to a woodworking friend of mine who lent me a handheld planer tool and recommended a woodcrafting shop I check out for protectants and sealing finishes for the table. The expert at the woodcraft store told us so long as there wasn't a black line all the way around the stump where the bark meets the wood that we'd be fine to leave it in tact. We were excited to find we'd be able to leave the bark on ours for that more natural look we were going for. Planing the top surface was pretty straightforward — it just took a steady hand and a little patience before we'd gotten that fresh layer of exposed wood we were looking for. Then it was time to pull out the sander. Have I mentioned how much I loved that this "DIY project" required the use or more than a few of my power tools? Then I took a break and Mary began sanding! We sanded and sanded and then sanded some more until we eventually began seeing those lines disappear. Also, who doesn't love seeing a woman working with power tools? 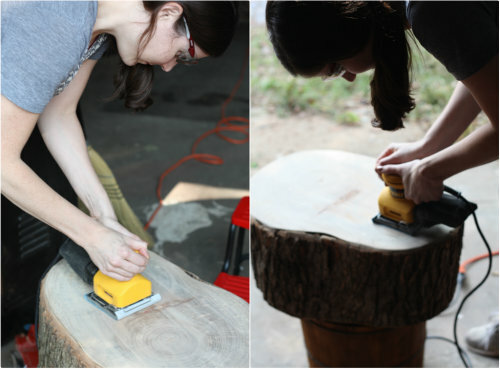 At one point, I set down my Full Sail LTD beer on the top of the stump while Mary was still sanding — it was at that point that this little table was beginning to come to life for me. 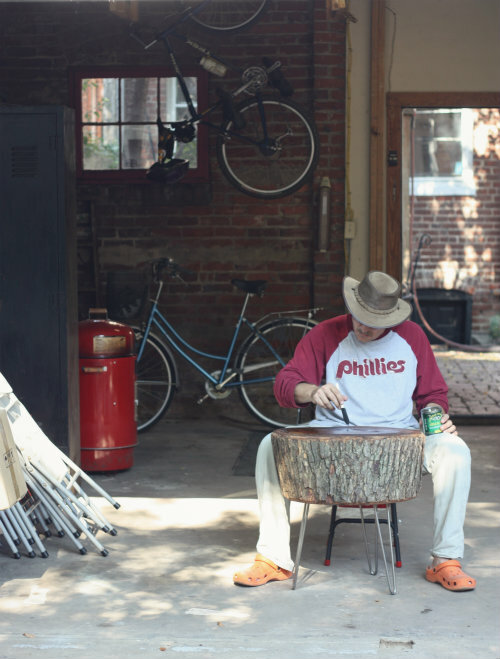 I could envision weekends with sports on the TV and a beer on the stump table by my side...it would only be a matter of time. 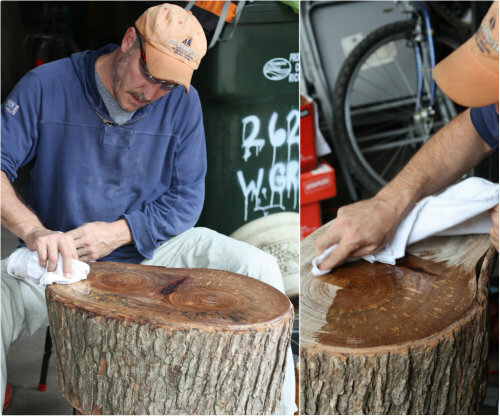 After we got every last ridge out of the top of this stump, I sanded it a couple more times with a finer grit sandpaper to really smooth and polish things up. See the two big eyes and beak in the middle? Pretty crazy right? We decided we wanted this side to be the top of the table since the double rings were most prominent on this side. Given the two sets of rings, we figured this slice of the tree must have been the portion of the stump where twins were about to emerge and branch out. After all that sanding it was time for a little wood stabilizer before flipping this puppy over to work on the bottom. 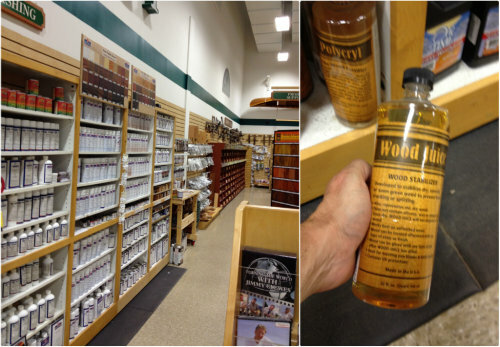 The expert at the Woodcraft store (along with my woodworker friend) recommended we use Wood Juice Stabilizer . Honestly, we were sold on the name alone, not to mention the fact it boasts being able to prevent checking, cracking and warping in wood. 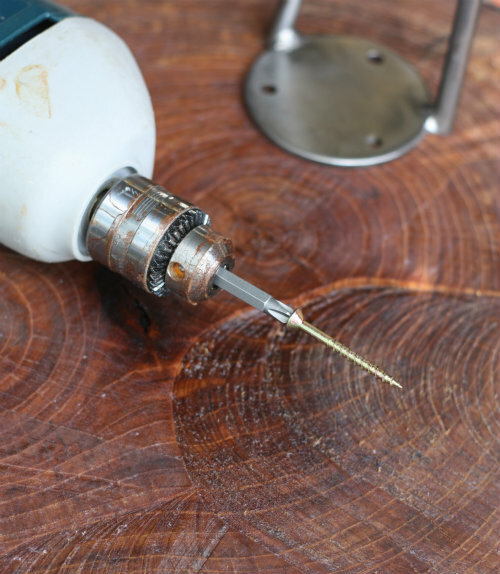 I poured and thoroughly wiped on 2 coats of the wood juice, which was fun to watch since the wood promptly absorbed it into all of it's nooks, crannies and rings, bubbling up a little as if it were thirsty. You could really see the intricacies of the wood coming through at this point. 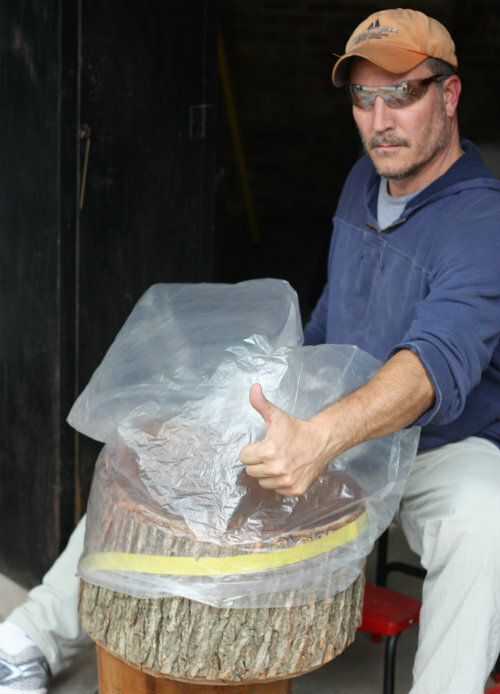 Once the stabilizer was applied to our liking, we covered it in plastic, as the instructions called for, and took a break. Whew! You may be able to see why we chose the other side as the top of the table from the picture above — we just liked the way the two rings were so much larger and more prominent on the flip side. You can also see how this slice of the stump must have been the starting ground for where the single trunk of the tree became two judging from how close the rings are on this bottom side. 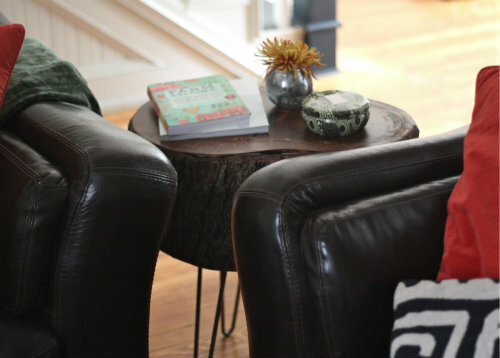 Like we said before, we love the look of the natural bark and wanted to keep it in tact. That being said, we didn't want to have to constantly be cleaning up little bark pieces and particles around the table once it was inside, so the clear gloss finishing spray made sure to seal everything in place and add a subtle sheen to the natural bark. Things were completely level after the flip (so we high fived) and we could envision this little project actually turning into the table we'd been talking about! 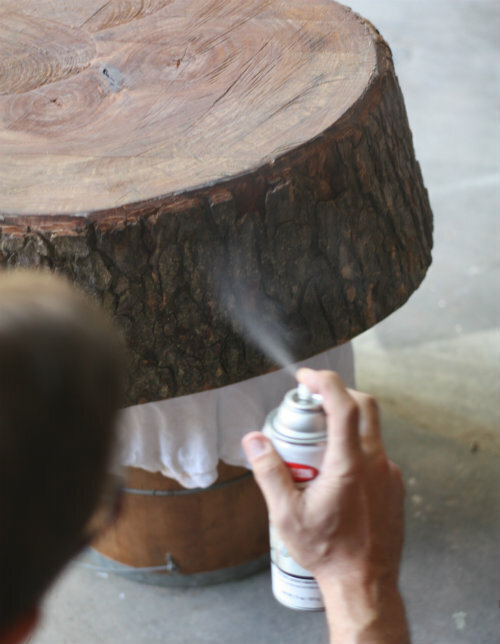 We felt like we were on the home stretch as we whipped out the can of topcoat and began sealing this stump table off for good. Applying the topcoat was fun in that we knew we were almost finished with the project and it was a pretty methodical and relaxing process since we had to go really slow and even. After we got the first full application of topcoat on the table, we cleaned everything up and let it sit to dry over the next 24 hours. 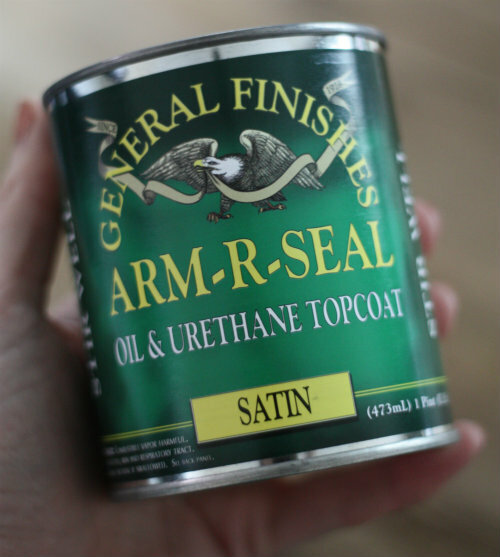 We ended up putting 5 very thin and even coats of the topcoat on the surface of the table, just to make sure things were sealed and set. After the 4th coat I gently sanded and buffed the topcoat with a #220 fine grit sandpaper before putting the final topcoat on. 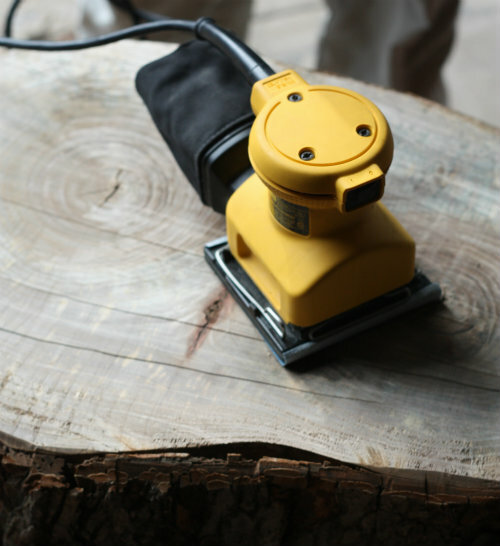 Sanding and buffing allows for a final smoothing of any ridges in the sealer and allows for a cleaner application of the final coat. 24 hours after applying the final coat of sealer, we carefully brought the table inside to dry and cure further over the next couple of days in our front room. 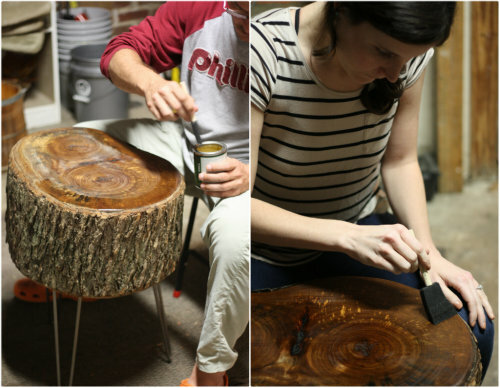 While the stump had plenty of time to dry in the garage, the differences in humidity of being indoors vs. outside vary greatly, so we really wanted to give the table a chance to take shape and set up in its final surroundings before putting it to use. Once we were ready to put the table to use for real, Mary started fussing with flowers, mirror glass vases, candles and magazines — all I could think was, what is happening to my manly beer table!? She assured me she just wanted to show the table in it's best light for this blog reveal and that our remotes, drinking glasses and other "real life" staples would most likely soon overtake the table once outside of the camera's spotlight. I bought it and went with it, though the books and flowers are still on the table as we speak and I have to admit, they are growing on me. This is the first piece of furniture Mary and I have made together, and we're feeling pretty proud of it. 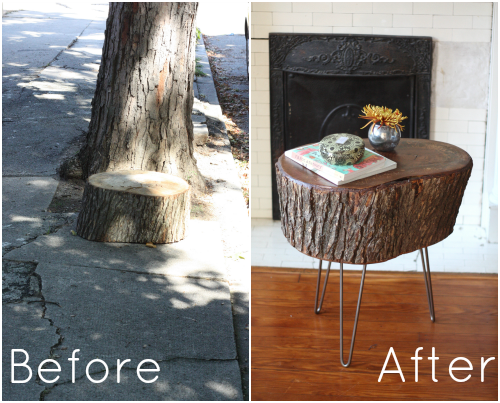 We're still in what we like to call the honeymoon phase with our new little tree slice table — every time we walk by it we stop to admire it and say something along the lines of "can you believe we made that table, it's just so cool." We also feel like the table has helped with the evolution of this room — replacing the red stool with something a little more substantial just makes the space feel that much more homey. 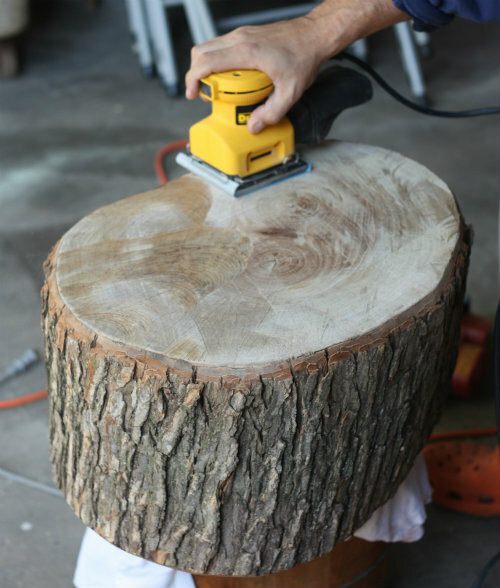 We hope this post has helped show how easy it can be to transform something headed for the trash into a beautiful piece of functional furniture that could be a new focal point in your home! What have you been working on lately? 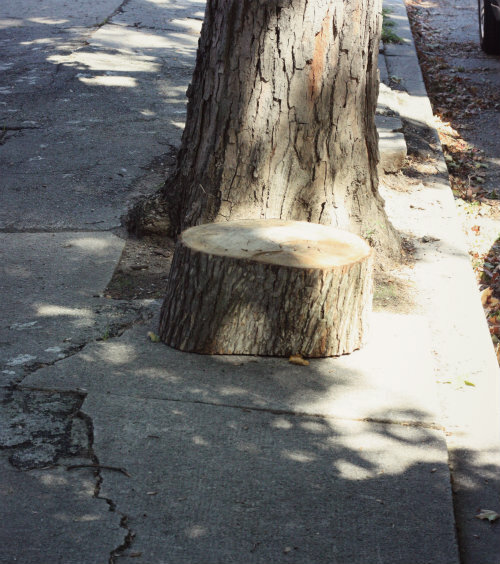 I am officially on the lookout for a spare stump, now. This is amazing and I love it! Thanks Cristy let us know how it goes! Wow… that is over the top. Well done. Thanks Gary we had lots of fun doing it. that is absolutely brilliant!!!!!! kudos to you both!!!! Love this! I really appreciate your DIY posts. I have an old baker's rack I am going to follow some of the tips you posted for the step ladder. Awesome table! If you'd wanted two tables you could have probably just split that thing in half horizontally, though easier said than done, I am sure. Great Jennifer let us know how it goes. We contemplated cutting this piece but we just loved the statement its size made. Maybe more smaller pieces to come! 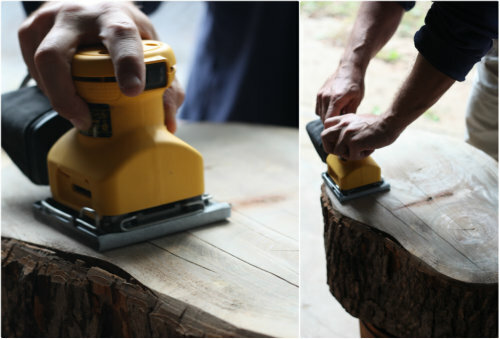 If you wanted to complete the woody look, you can make coasters and plate mats with wood pieces. Keep doing what you guys do! You both are the source of my inspiration! So. Stinking. Cool! Seriously, I'm with Cristy and keeping an eye out for a stump, or multiple stumps so I can have a matching pair :) This might be my favorite DIY you guys have put together so far. Thanks Angie. Tim has started saying stinking cool all the time now because of this comment. He thinks those words are well... "Stinking Cool"! 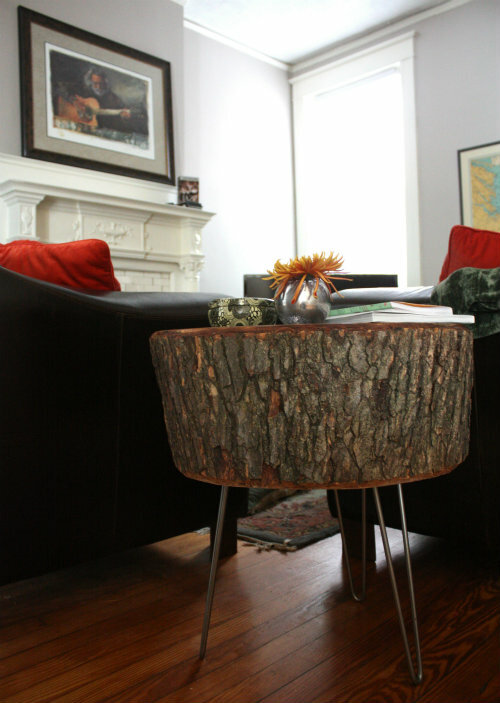 Repurposing that stump was a great idea! The end results look fantastic. Cheers for showing us the process and the products that you used and I can't actually see where that beer is going to fit...;) Here's hoping that Basil doesn't decide to tackle the table like he tackled your grape! Basil has not shown any interest in the table at all. Whew! Thanks summersky! We are quite proud of this piece. Thanks Morgan for checking it out! Are you two and your interior decorating skills available for hire? Haha not sure if we are ready for that but we are certainly are having fun in our home! Thanks Rick for stopping by! So when you wrote this, it totally reminded me of my husband and i. I am forever finding things to "upcycle." :) Completely looooove the finished piece! You guys rocked it! Thanks Jasanna! We were quite pleased with the outcome! What are some of your cooler upcycled items? We would love to know! 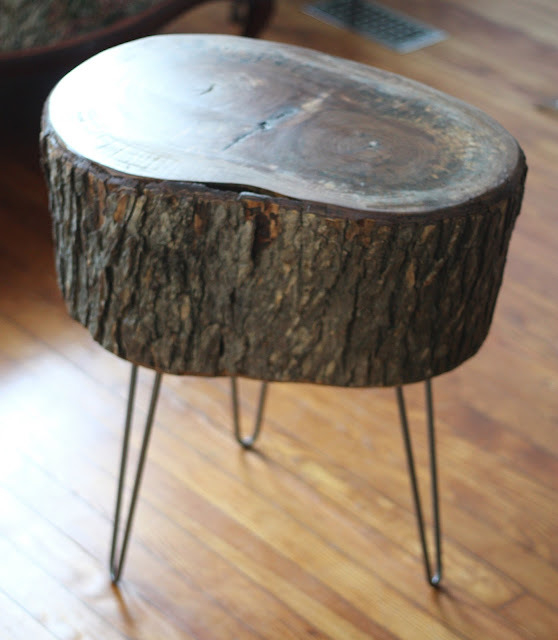 I saw that stump table floating around on Pinterest this week, and had no idea that was your own project! Way to go! I've been considering something similar since we had a big tree cut down last December - never got around to it though. I will be following this tutorial exactly - thank you! The legs so work with that slice of stump. And I think your legs are great too, both of you! hee hee hee. Thank you for sharing your projects with us! So beautiful! And I ESPECIALLY love that you found the original inspiration by the side of the road, as refuse. Good for you to see the beauty and potential in what was trash! PK, I will not be doubting Mary's vision for things anytime soon! 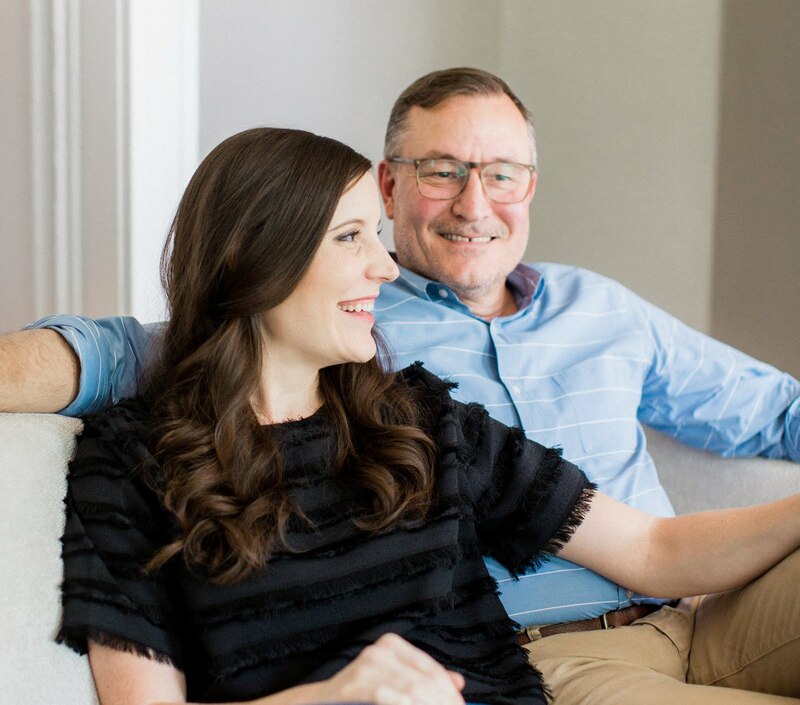 Love your piece -- and it's a fun post to read. Been saving a slice of the 'family' chokecherry tree that came down in a storm a few summers ago. 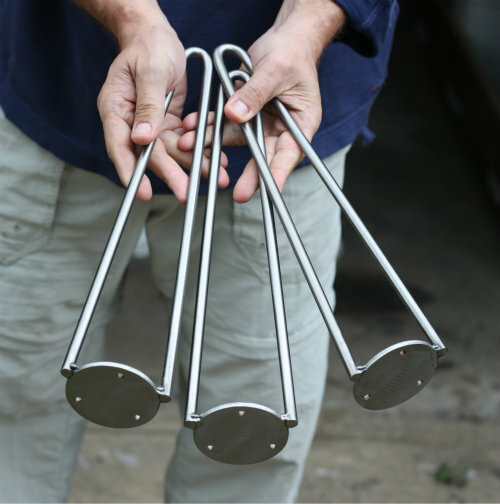 So glad to find hairpin legs made here in the USA. Thanks for sharing! Wow that sounds wonderful please keep us posted on the outcome! Thanks so much for stopping by and for the kind words! This is awesome, you guys. You should leave a picture of the table where the stump was so the people who threw it away will be sorry! Ha, we should make up a lost and found poster for that tree! So funny! 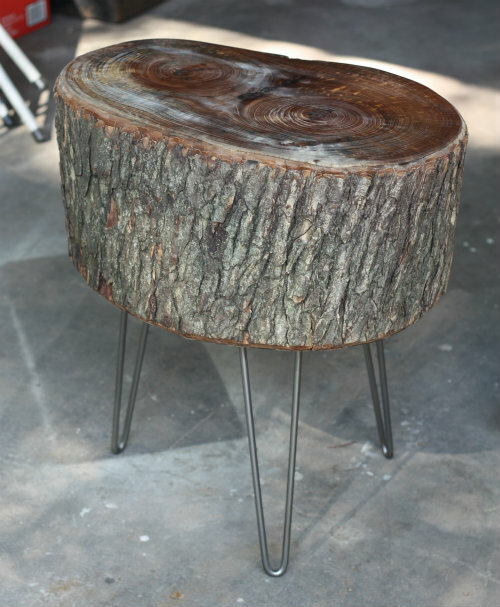 I have been looking for a way to use an old tree trunk! Thanks for the great step-by-step instructions. Thanks Hannah for stopping by and good luck on your project! This is amazing! My boyfriend and I actually just bought about 8 red cedar wood tree slices a bit thinner than that stump... and we are just waiting for the hairpin legs that we ordered to arrive. I swear! What a coincidence. Thank you so much for the product advice, we hadn't decided on a sealer yet. Amazing work, it's so rustic modern. Love it. Wow! We would love some before and after shots! Thanks for stopping by and hope to see you around often! what a fantastic table!! you two did an amazing job! Thank you Luna that means a lot! This is incredible, and thank you for such a thorough tutorial! I know you used a broom to sweep the top...what did you use to wipe it down? Also did you spray the krylon spray in just one coat or more? Is it still holding the outside bark on? I don't want to get any step wrong :) We also have a little kids and I don't want them to be able to damage that bark with their curiosity. Thanks! Thanks Mia, so glad you might give this a go! Ha, yes we used a broom to sweep it off — not too technical! When wiping it down, we just dusted the whole thing with a broom and an old t-shirt of Tim's. We sprayed a few different light coats of the krylon clear coat between dryings just to ensure everything stuck in place and it's been holding up well. Keep us posted as you try it and send us pics — we'd love to see what you come up with! Woof, woof, woof! Yap, yapp, yappp! I'm always too lazy to comment on blogs but I just had to stop and comment on this one! Aww thanks so much we hope we see you around often! Thanks for stopping by! If my style could be encapsulated in one small table, I believe this is it. Beautiful work! 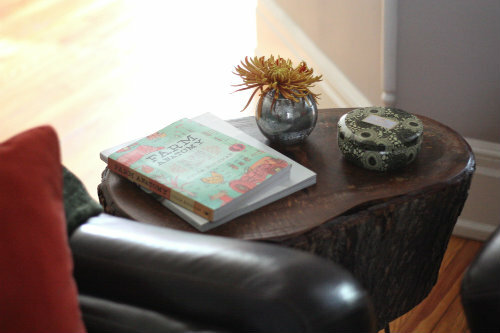 I recently made a sofa table with a reclaimed wood plank and hairpin legs, and this incarnation puts that to shame. 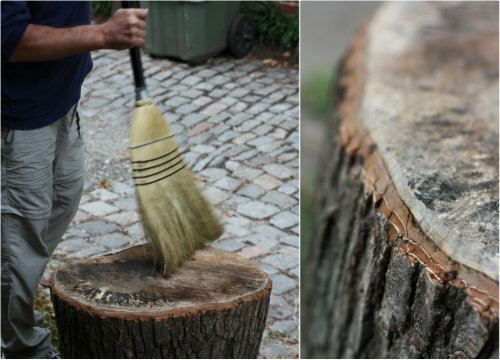 I have to find a stump and do this immediately! Thank you for the great tips. 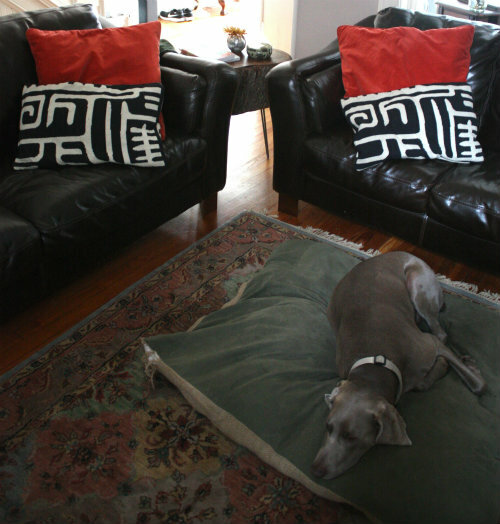 Lindsay, welcome to 17 Apart if you also live in the fan and see us walking our Weim Basil please say hello! Love this! I am considering doing something like this myself now! Thanks so much for taking us through your journey! Awesome Dawn! Let us know how it turns out if you make one! AWESOME TUTORIAL. I have a huge stump in my living room that's been there for years. 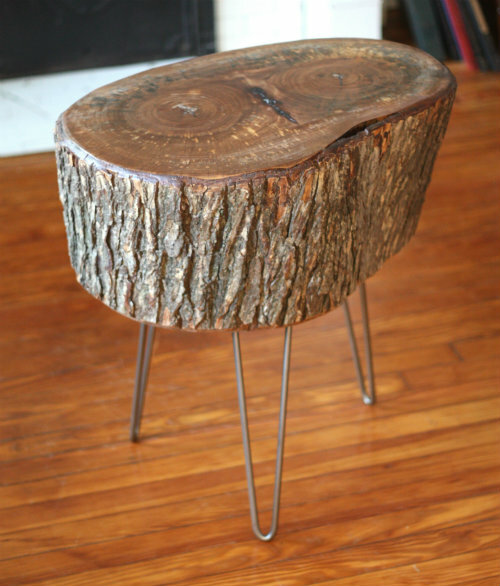 It sheds bark, and it's annoying, and I was thinking about carving it into something, but now I want to buy those hairpin legs and make an end table, which we could also use...Thanks for posting this. You're saving me a load of time researching what products to apply to the wood. Aw thanks Kim — this was such a fun project to take on. 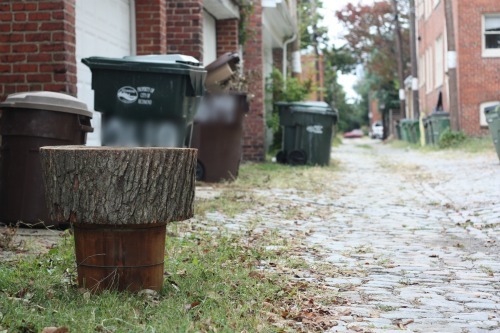 Let us know how your stump turns out! 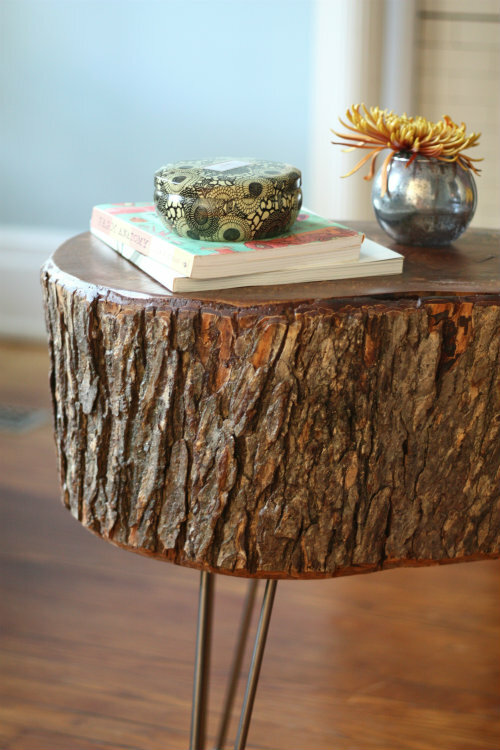 We love the idea of decorating with tree stumps. Thanks for the tutorial! Def going to share. Thanks for stopping by! Hope to see you around here often! I have to tell you, I bookmarked this link a long time ago and haven't forgotten it! It's been a project I've really wanted to do. Today, while driving around, I saw someone had cut down a tree and left all the wood cut nicely in a pile, so I grabbed a stump! 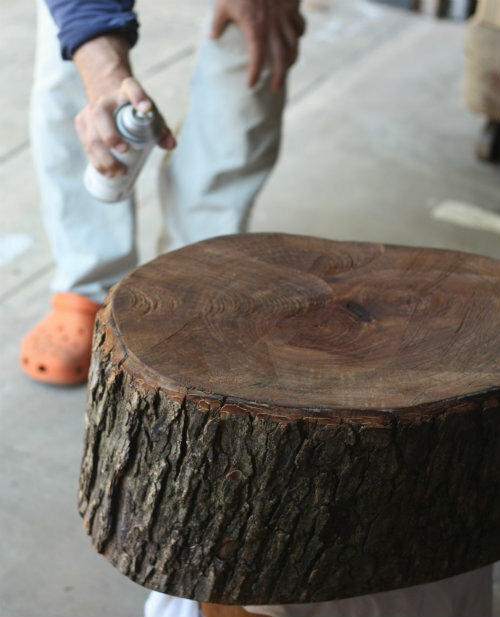 I was wondering if you just put the topcoat on the top surface of the wood, or if you put it around the bark as well? Hey Katie, that's awesome! 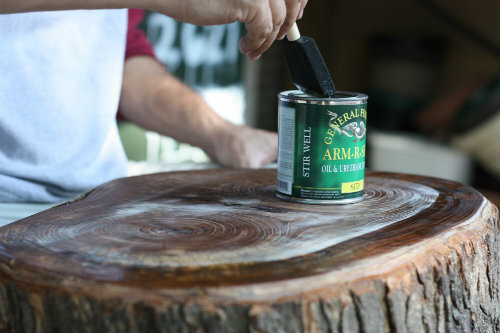 We put the topcoat only on the surface of the wood, but we did spray around the trunk with a clear coat sealer in a can! Let us know how it goes! Great article, it's inspired me to give it a go. Where did you find the hairpin legs? Hey Kassandra, your table sounds amazing! We ended up with about 5 thin top coat layers and it dried just as thin as the wood! I love this table. 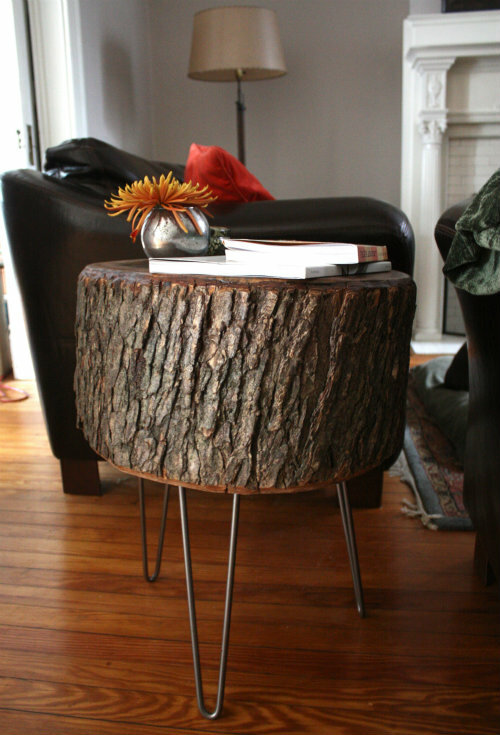 I have a tulip-poplar stump waiting the same treatment. 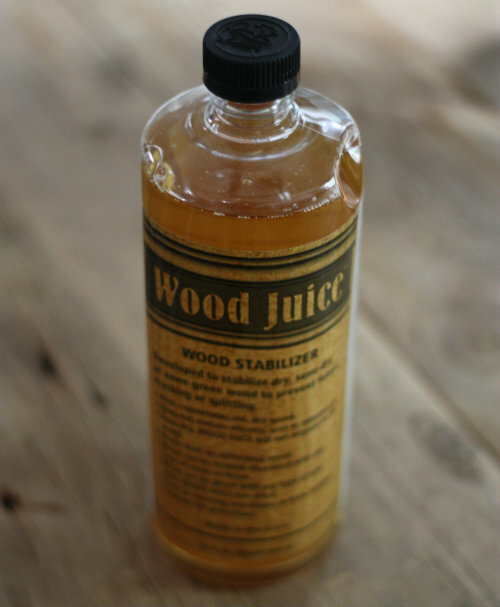 How much wood juice did you end up using? Yes it is very interesting post.I like this table because it can be use for many purpose.Thanks for sharing. Thanks so much for the tutorial, I'm actually using it for two purposes. 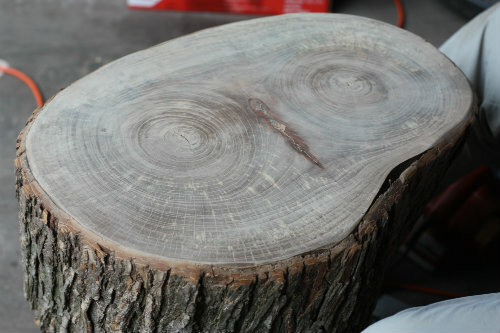 The first is a large loblolly pine cross section (or "cookie") that I am turning into a side table like yours. 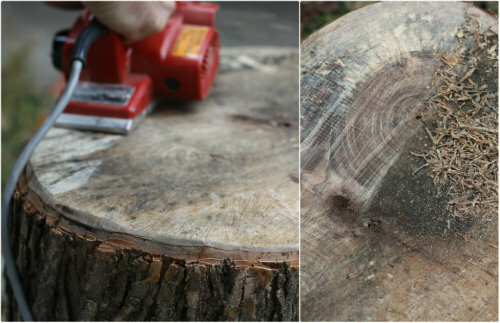 I'm expecting your tips on products will really bring out the pine's beautiful tree rings. Second, I'm helping some friends turn some smaller pine cookies into centerpieces for their wedding reception tables. 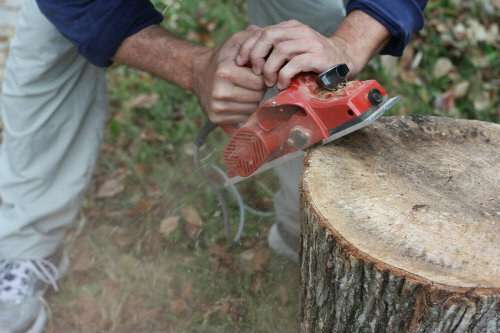 This brought up an issue that others might find useful: differences in dealing with green or freshly cut wood. Soft wood species (like pines) contain a lot of water and as they dry the cell walls will shrink considerably causing at least one really large, unsightly crack. 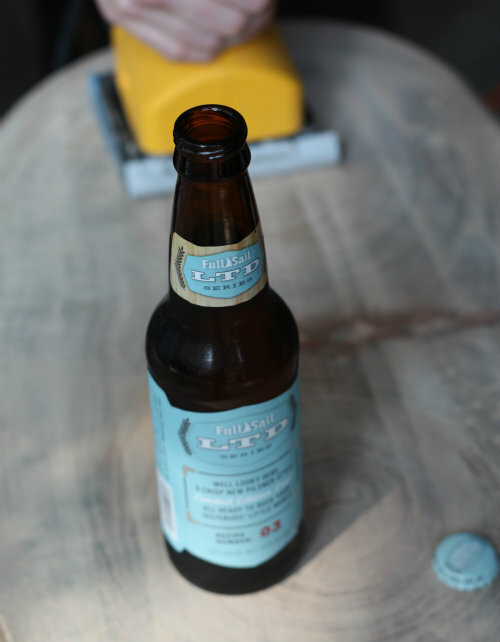 Wood Juice is best used on wood that is already dry. 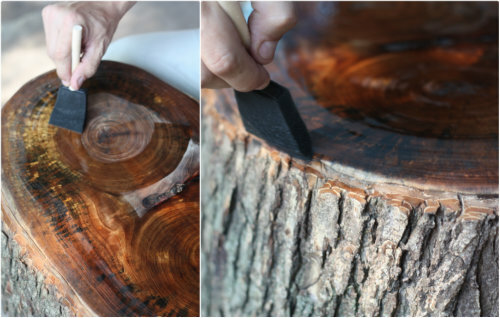 In the case of green wood, you should use a wood preservative like pentacryl that literally pushes out and replaces the water, allowing the cookie to dry without cracking. 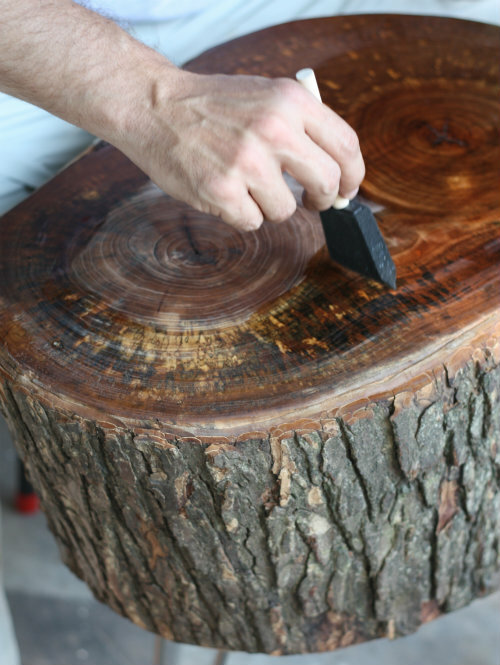 Also, you will save more of the beautiful bark if you cut the tree in the winter when it isn't growing (unless it is freshly dead, in which case you should cut it up immediately before it is attacked by insects). Thanks again for all the tips! Nice post,It is very useful information.I shall try to make use of tree stump for any work.Thanks for sharing this post. We hope you will let us know how things turn out! Found some great similar wood slab tables like this on Etsy with some cool colorful hairpin legs! Great job! This is ridiculously amazing! Love the creativity. I'm going to have to make time to make one! Good luck Kim! Let us know how it turns out. I am going to make this! I love it! 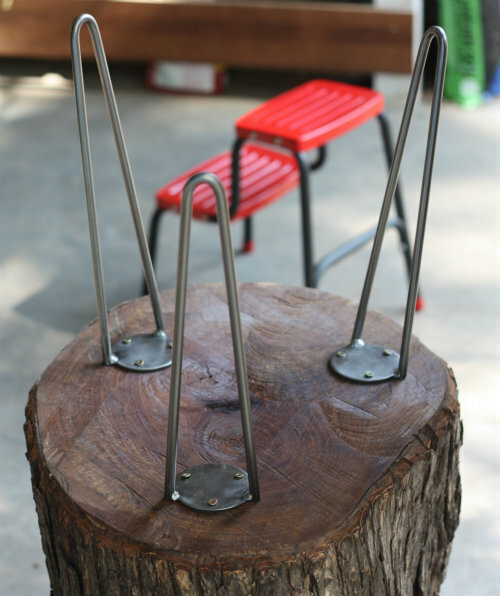 My husband and I made one of these instead of pin legs we used a small picnic stool painted black. I love it. We are going to make some taller ones to set around with pillow to set on for extra seating. Amazing job guys, is it oak? amazing..you two spent a lot of time on that project but very worth it, I am sure. I have to preserve trees that are in my house supporting it….they are white birch…would I use the same chemicals? Came out great! Did you let the stump dry out at all? Thank you for this! I have been searching for hairpins legs that don't cost a crazy high price for so long! You totally just made my nightstand project a reality! I love this diy. Thank you for your step by step photos. I really felt like I wanted you to rescue this piece of wood, and giving it a home. Great job. So glad I stumbled across this. All the other tutorials remove the bark. I read where eventually it will fall off even if you've sealed it. Thoughts on that? I have a stump waiting to be table-fied but I want to leave the bark on! How has the bark held up after a few years? I am starting a project where retaining the bark is the most important element? Thanks. Great Blog. I love it. I have been saving a thinner piece of wood from a tree for something and now I know what it is. I am going to go dig it out of the garage now. Thanks for the post. Very cool idea. I would love to do this! Fantastic. Looking great. Thumps up. Was wondering if the bark is still intact on the table? Great idea! Plus the fact you and your wife did it. Thanks so much for this! 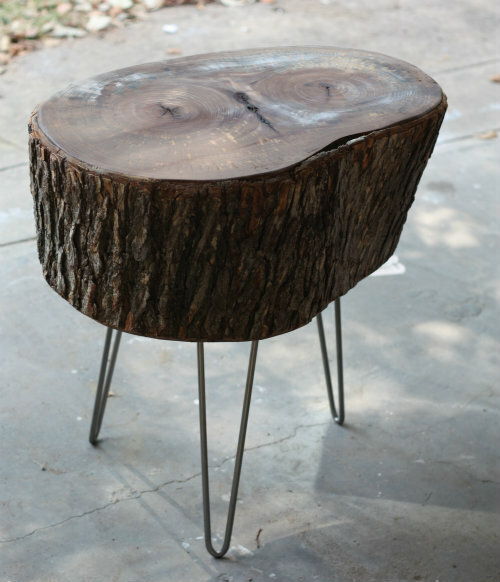 I have a wider taller stump that I have planned to use as a side table also. Maybe I'll cut it into 2 since it isn't movable as-is. Your table is beautiful! Wow. Looks like you bought it in a high-end store. You put a lot of work into it and it paid off. Great job guys. Hi! Was it the stabilizer that made it cloudy? I have a chopping block in my kitchen that my dad made when I built the house. Its part of a tree they cut with a chain saw. He took all the bark off and turned it upside down and poured over 5gallon of Wesson oil in it to hopfully keep it from cracking. That was in 1986. It took 3 big men to get that heavy log into my kitchen. It has 4legs cut out also. And today it is my most precious piece since hes not here. And in 2015 its so much lighter. I can move it alone, but it has beautiful small cracks not split into. I have it all natural with no stain, varnish or anything!! I love it!!! WOW! Great job! It really turned out beautifully. Thank you for sharing. A few years ago they took out the trees between my parents house and the next property, trees that had been there my whole life and being sentimental as I am, I saved a huge slice for just such a purpose. So I am going to follow your lead and get working on it. Thank you for the tips! So happy I ran across your blog! Very pretty table. I have a cedar stump that I have been thinking of doing the same thing. Thanks for inspiring everyone! Great Idea!!! Aside from the clear finishing spray, did you add anything else to the bark? I love the natural look with the bark on. Love the Jerry pic ;-) great read! Great photos! Thanks for including the name of all the products you used and the etsy link! Cheers to many ringless beers! How old was the stump when you found it? 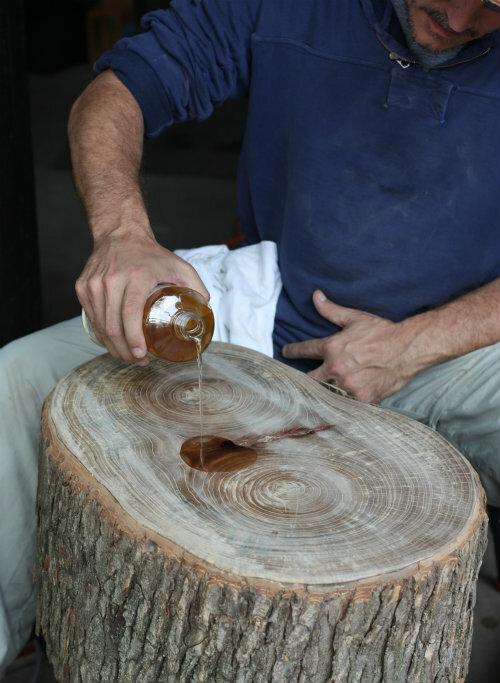 Did you have any issues with sap seeping up through the wood? IF so, how would you have dealt with that? Wow, this is one of the best written tutorials I have ever come across! This is very well done guys, from the instruction, to the photos , to the materials used. You rock! This is fantastic, I want one of these so bad! Awesome! 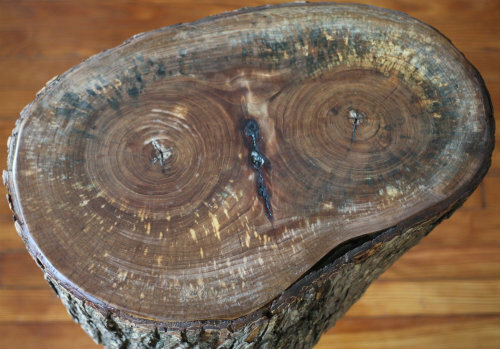 It looks like the face of an owl! Love this idea. 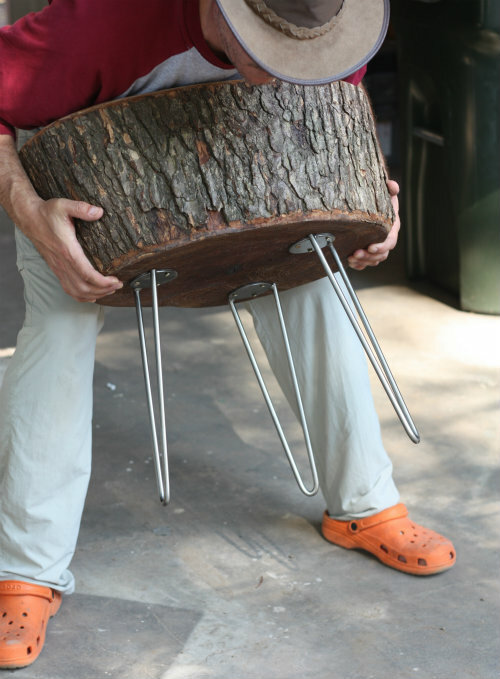 I just cut down a cedar and want to try this. My question is did you have to dry the stump for a while? To prevent splitting? Thanks for posting. Really I love it ... well done , bravo . Love this table! I know this is an older post, but I was hoping to get some insight as Im working on the same thing for my home. How and the hell did you get the surfaces level? This table looks great! I am sharing this on Pinterest. Just saw your project on Pinterest. I'm amazed that this was your first furniture project. You seem like a "old pro". Really, it's absolutely lovely! Your step-by-step instructions seem so easy to follow that I'd like to do this myself! And thanks for sharing the actual products you used. So helpful! I love the slight flair from the bottom to the top, like it was made to be a table. Real bonus being a 'double' trunk too. Great work guys! Your table is an inspiration! We had an 80-100 year old oak tree cut down last weekend. 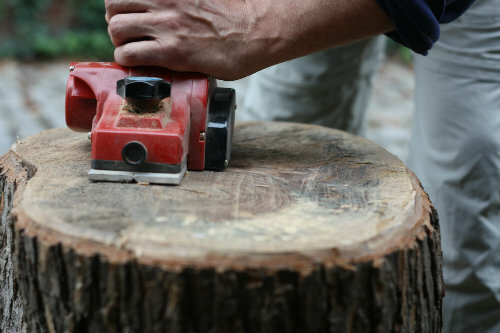 We had the tree guys cut a piece of the trunk I am guessing is about five to eight inches thick so we can make a table of some type...either a bistro or coffee table. Nice work and thanks for sharing the step-by-step details! 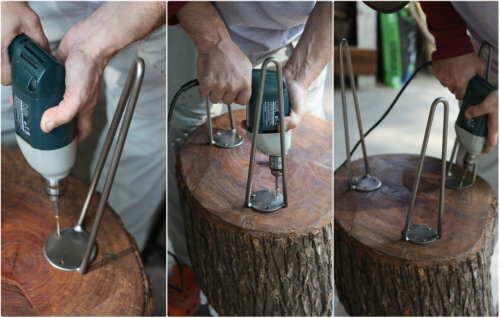 I am making stools for my mom's birthday and wanted to keep the bark as you did but after muuuuuch searching you are the fist ones to show me how to do that. Thanks bunches!!! I have noticed the couple who made this table hasn't made a post for quite some time. 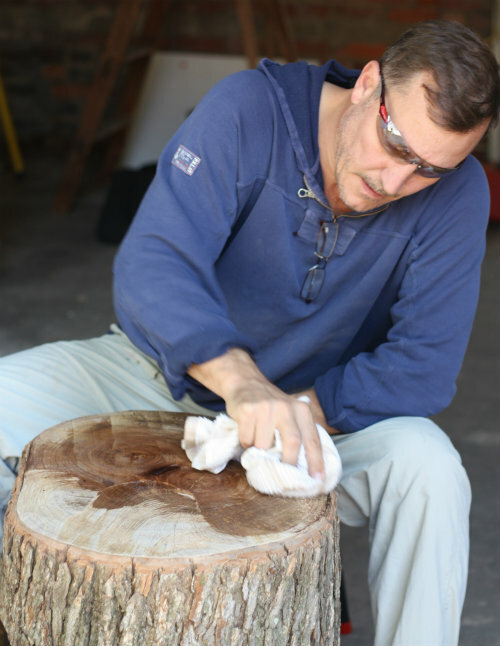 I appreciate your post, as to how how it actually takes for the drying of wood. My hubby makes walking sticks, and he let's the wood for those dry a year before doing any carvings etc. Thanks for your post. Thanks guys. I've picked up lots of tips for my venture here in the cold and wet north of England. You wrote this piece exceptionally well! The table is glorious! Working together, creating something beautiful, and sharing it with us all has got to be very rewarding. Talk about goals!!! Kudos to you both. Beautiful and extraordinary piece. It is rare that you find something like that in the city. 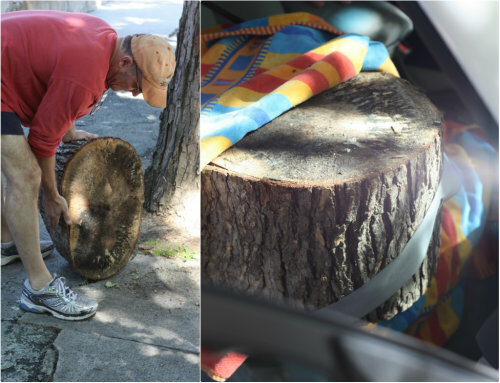 Now you have a newfound hobby and love...Time to go hunting again for stumps in and around the city! All the best! So fun! I am sharing this to Pinterest. Thanks for the stump pictorial. It is beautiful, and was very entertaining to learn the process! Great post and great looking project. The details you offer will translate well into so many other ideas. Just saw this on Pinterest, and ended up staying for the whole project... love the way you write, and the piece turned out great! Isn't it fun to see something take shape and be useful that you made with your own hands!? You did a beautiful, professional job on that table! I am so glad you researched finishes and used good quality products and listened to expert advice. It looks gorgeous and should last for years to come! 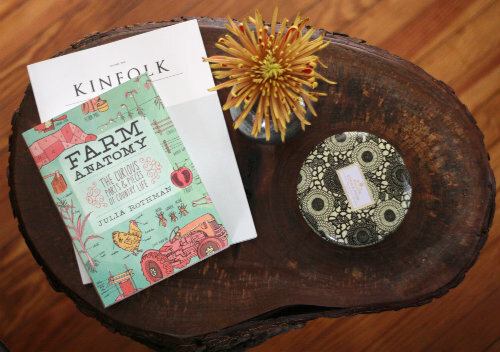 I love using natural products in our home. Great job and great tutorial! 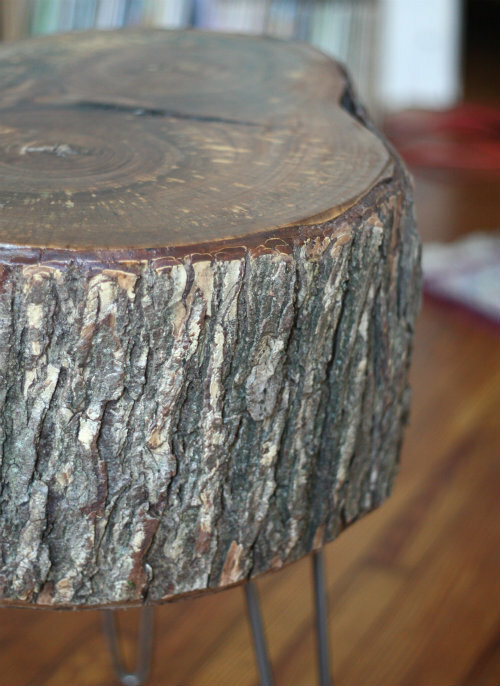 I'm painfully new to woodworking and I inherited a stump slice like this (it was leftover in the garage of the house I just bought) and I want to make a similar table. How did you make sure the table was level before attaching the legs? the bottom of my stump seems to be cut at a pretty extreme bias. Do you have any tips about how to even it out (or even leave it and just adjust the leg height)? I love this! We just moved into a house with a huge woodpile in the backyard, containing probably 50 big stumps that could be used for tables. We just made a bench using this same technique from your website & it turned out GORGEOUS!!! Thanks SO much for sharing!!! Love this! Is there anything you would have done differently? on. The spinning motion will cut faster and changing the different grits is just a matter of peeling one off and putting another on. 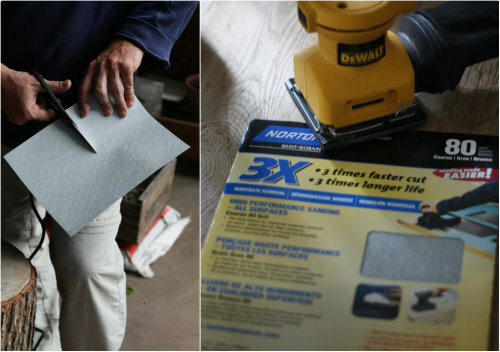 All you have to do is line up the holes in the paper to match the holes in the sanding pad. It is not hard to find any grit you want for the pad. Just my two cents worth, but your table looks good to me. WOW. LOVE IT!!! I just got my stump today and I'm ready to go! Tim and Mary your table looks fabulous! I just cut down some oaks and saved some stumps. It's a huge work in progress... Two questions, how long does the stump need to dry out for? I am starting to see splits after only 2 months, but I keep hearing it needs to be "seasoned" for a year or two. By then they will be very split. Can I seal them now or do I need to let them dry out longer, they were cut Dec. 9. Second question, if you were to sell your stump, what would your asking price be? I am thinking between 125 and 275.00. If you can reply, thanks so much. I loved your diy post, very thorough and easy to follow. Wow! This is beautiful! I do have a question though. On the top of the table, down towards the bottom of the 'beak' it looks like the bark is gapped away from the actual tree? Did you seal this as well? How did you do it? I would be afraid that at this point the bark would be able to come off of the tree stump! I have about 2" thick slice, how should I treat or stablize to prevent from cracking?